Keep OFH on a roll! Join the throng at the San Juan County courthouse at Second and Reed Streets. 11:30am-1:30pm (but come and go as your personal schedule permits). YES! We are still planning to hold our Citizens United anniversary demonstration and still hope to have a larger than usual group. 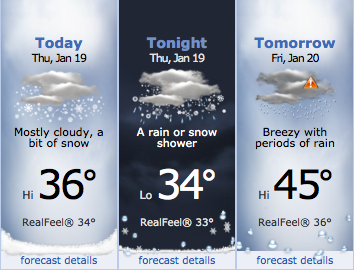 The forecast calls for it to remain below freezing until sometime Friday with little, if any, additional snow. Road crews should have most major thoroughfares (e.g. Bailer Hill) cleared and sanded by then. It may well rain Friday and will definitely still be cold. So layer up, bundle up and take steps to keep as dry as possible. Why is the middle class disappearing? Actual data. The economic challenges and strains facing middle-class Americans are likely to get a good bit of attention between now and election day, at least from the Obama campaign. They include sluggish income growth, heightened financial insecurity, rising health care and college costs, and falling home values. Each of these is important, but the most critical in my view is slow growth of incomes. The following chart tells the story. 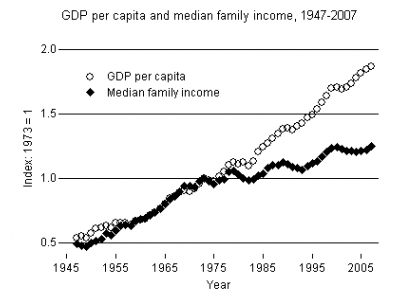 It shows inflation-adjusted GDP per capita and median family income from 1947 (the earliest year for which the income data are available) to 2007. To facilitate comparison of the over-time trends, each is indexed to its 1973 level. Since the mid-to-late 1970s, growth of income at the median has been slow — very slow — relative to growth of the economy. 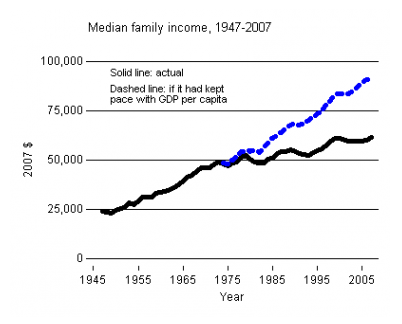 The current decade, with no improvement at all in median income, is especially striking. The dashed line in the next chart shows what median income would have looked like had it risen in sync with per capita GDP. The difference is huge: in 2007, the median family’s income would have been $91,000 instead of $61,000. Various excuses and rationalizations have been offered: It’s okay because Americans now get more in employer benefits instead of in their paycheck. Family size has shrunk, so slow income growth isn’t a big deal. A lot of those in the bottom half are immigrants, and even with slow income growth they’re better off than they would have been in their native country. None of these is compelling (see here or here). The disconnect between economic growth and middle-class income growth is due largely to rising inequality. In the past several decades much of the economy’s growth has gone to those at the top of the income distribution. Faster income growth wouldn’t render other middle-class strains irrelevant. But it would help.